12/19 Wednesday, 60’s/55, sunny, light wind - We were going to go out for groceries and supplies first thing this morning, but the car was already taken. Not a problem - we dove into reinstalling the transmission instead. Piece by piece it all went back together very nicely. Dobbs removes the starter to access bolts for the bell housing. Bell housing off. It doesn’t fit out through the cockpit hatch, so we manipulate it in the well. 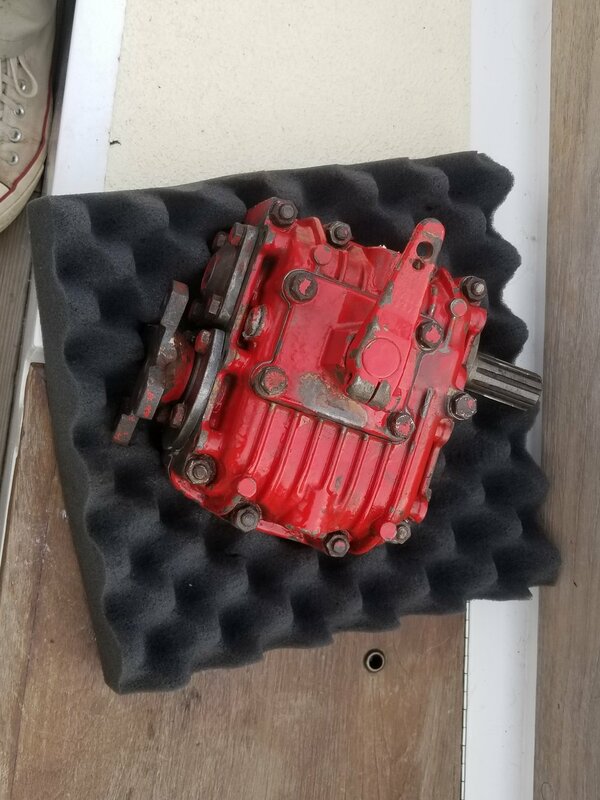 I’ve lowered the transmission into the well. Dobbs reaches in from the starboard quarterberth access to bolt it on to the bell housing. Bell housing going back on. Some of the fasteners (like the ones behind the oil pan) are accessed from the front. Bell housing with transmission reattached. Mating the spline with the crankshaft was a bit of a chore, but persistence got it done. Note that we had to un-bolt the engine mounts from the stringers to get enough working room. Mounting the drive saver flex coupling. Dobbs inserts the screws and adjusts the coupling position and I tighten the nuts. Beginning to connect the shaft coupling to the drive saver. All that remains is realigning the engine and prop shaft. Around 3pm, the car became available, so we ran our errands. Rich of “Green Ayes” invited us for happy hour aboard his boat. 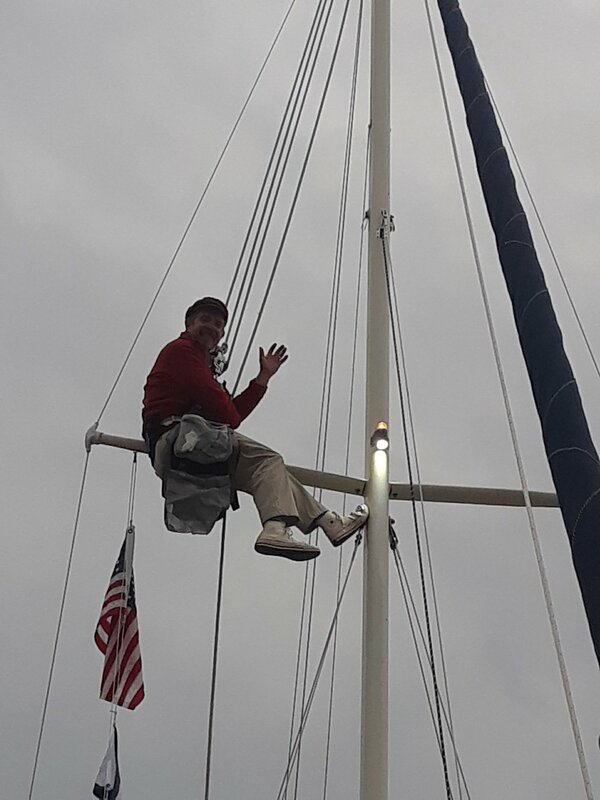 We took the chair and, before relaxing, Dobbs climbed the mast to the steaming light and replaced the bulb. Rich opted for an incandescent this time. It’s a shame when an LED shorts out, as they occasionally do, because they cost substantially more than an incandescent. Still, in the last ten years, their reliability has improved exponentially and prices have come down, too. In a steaming light, the power draw of an incandescent bulb is, in most cases, mitigated by the fact that the engine is running and therefore charging the batteries. Dobbs also took some time to show Rich how to fix (as in set screw) the orientation of his main sheet blocks, to keep the mainsheet from twisting on itself, and to re-route the sheet through the blocks in the best configuration. I took a peek at the chainplates since we know the original Pacific Seacraft chainplates (in particular the shrouds and backstay) are prone to failure. When the boats were built, in order to make the square carriage bolt holes in the chainplates, the holes were first drilled and then the corners were nicked out with a punch. This creates a pinch-point weakness in the metal that leaves it vulnerable to cracking under load. Sure enough, five of the six shroud chainplates had cracks at the top bolt holes (Lesson: Never invite a rigger over for happy hour). These chainplates should be replaced. The good news is that Pacific Seacraft, alive and well in North Carolina, offers exact match new chainplates that are cut with a water-jet, eliminating the weakness the originals have. On the PS34, replacing the shroud chainplates isn’t too big a deal. If I recall correctly from a project two years ago, the starboard forward lower shroud chainplate fasteners (at the back of the V-berth hanging locker) had fiberglass over them that had to be carefully cut away. Beyond that, some of the backing plates had carpet over them, which we sliced and gently peeled back for access, then re-glued with spray adhesive when we finished. Some were behind teak slat trim. On those, we extracted the bungs to access the fasteners to remove the trim, and then put new bungs in and touched-up the teak finish afterward. 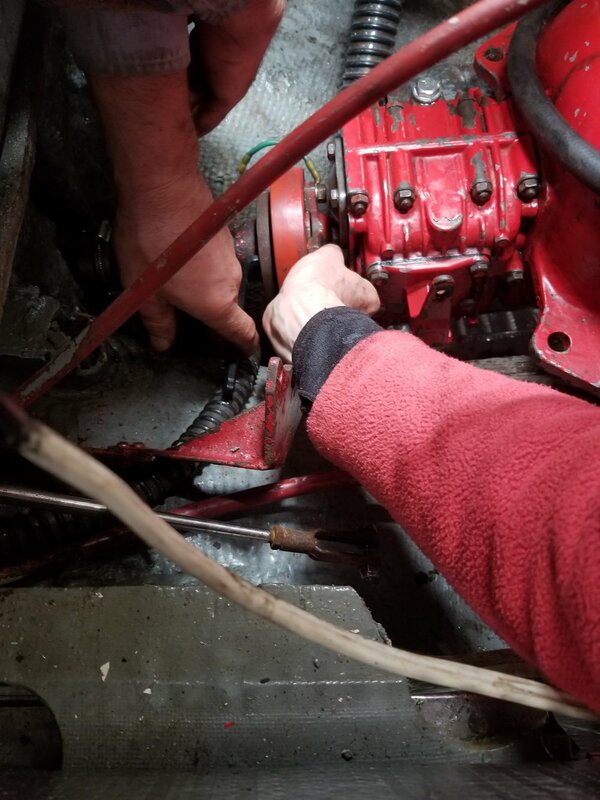 The chainplates weren’t bedded with anything crazy aggressive, so they came out cleanly - we used a halyard to pull them up from behind the rub rail. Rich set out a nice plate of cheese, hummus, crackers, and cashews and we sat below, sharing stories until it was time for Dobbs to walk Murphy and me to start on dinner. I made spaghetti - quick and easy after a day of transmission wrangling and rigging work. Tomorrow’s forecast is for rain and a southerly blow through Saturday morning. As soon as the rain ends, we’ll finish the transmission alignment and test the repairs. My fingers are crossed!